The world of Shanghai is full of contrast. Both in the people and the environment. Qiao (the other guy who is on exchange with me) spoke about how it's still a developing country, but I look outside the window I see rampant technology. I guess that high technology doesn't mean developed country nor does it mean that it's "modern". Maybe a better world would be "refined". There are systems that are still being developed. It's evident in the cityscape. Shanghai has 2 banks. One bank is older, full of art deco and European colony-like inspired houses. 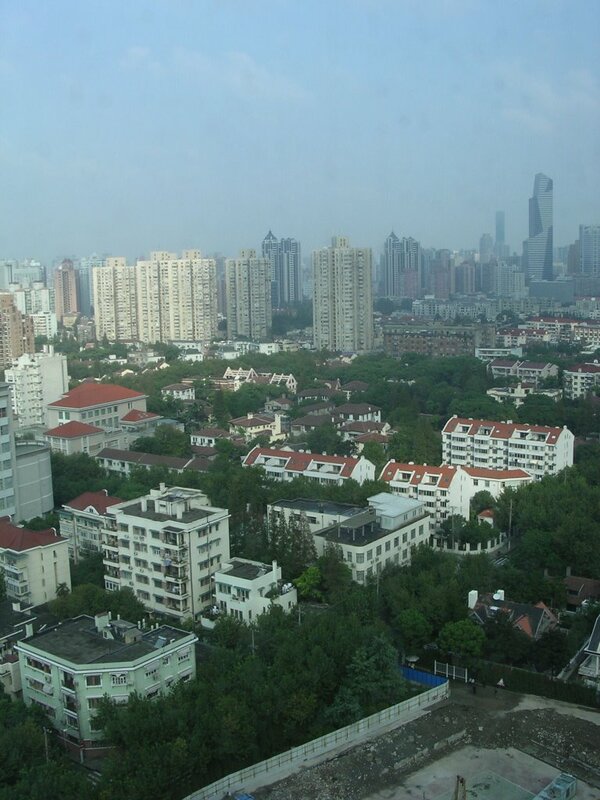 There are a large amount of apartments that have a huge Chinese families within them. The other bank has huge skyscrapers out of a science-fiction landscape. There are a lot of classes of people here. I see state service workers sweeping the streets and doing construction in bare feet. Contrast that with fancy Porche Cayenne parked in the street in front of a poop smelling apartment building. An example of how the systems are still being developed. The streets are crazy. I cross a 8 (perhaps 10) lane road, Zhao Jia Bang Lu everyday to go to work. People ignore street lights and the pedestrian is considered an obstacle to go around or to be run over. There are very few rules of the road. Lots of motorized scooters driving down sidewalks. People pass on the left and right. Taxis make their own turn lane. If there are cars that are blocking your path, it's okay to drive around them and into the oncoming traffic. The funny thing is people don't get mad when they get cut off. Very little accidents, if any. Qiao calls the whole scene, "Flexibility...the Chinese are flexible." I can see that in their culture if Shanghai is any indication. Speaking of systems, the WK Shanghai office is around 2 years old and the office is still being ironed out. People here are young and full of energy. They start around 9am and are here till 10-12pm everyday. Everybody. People are work here a lot. But they still have the WK vibe here. It's a very safe environment. Yet different Chinese dialects, languages and working with local vendors can create a frenzy. Through observation they reach the finish line strong, even in a spectacular, fiery wreck. Reminds me of the Bonfire days when I used to work there. A lot of people at WK Shanghai wear a lot of different hats which can be a good thing and a bad thing. "Controlled chaos." says a co-worker, Rob Mumford. Mumford is another friend in Portland who has spent time at the WK Shanghai office.